Beto Hale is a Mexican-born musician who has since move to the United States and finds himself creating music that contains many different aspects to the music. Those styles of music make Beto Hale’s music unique and different. That different approach to each song makes sure each track Beto Hale creates has its own sound and feel. And after having already created a catalog of his own music, Hale is celebrating the release of his newest release, Rebirth. For the music on the new release, Beto Hale took his time creating and shaping the songs and making sure that they felt just right. He also brought in Tony Levin to add his touch on bass and Marc Mann helps to add guitar from one track to another. Beto Hale’s album Rebirth begins with “Explosiones”. As Beto Hale is Mexican-born, it should come as no surprise that the lead off track for his new album is a track in Spanish. The track finds Hale exploring a very progressive sound on the track. For the music on the track, Beto Hale took his time creating and shaping the songs and making sure that they felt just right. The rock/jazz mix in the music gives the track a slightly unique feel as rock and jazz both find their own place in the track as the guitar and keyboard alternate as the lead instrument throughout the length of the track. With the next track, Beto Hale changes the feel of the album. The track of “Falling Down” takes on a feeling that seems like a mix of The Police and The Eagles. The track features some of the best bass lines I’ve heard in a while as Tony Levin lays down the groove for the song. The alternating of styles in the track gives the listener a taste of Classic Rock while still containing a little of the jazzy feel that was found on the previous track of “Explosiones”. And while“Explosiones” features Spanish lyrics, “Falling Down” features Hale singing in English. Rebirth from Beto Hale continues with the track “Sube Al Carrusel”. This track is yet another track that explores the different sides to Beto Hale. As the first two tracks show Hale’s rock side off, “Sube Al Carrusel” shows off his jazzy side. The Spanish vocals on the track also add a touch of jazz to the track. With the different aspects to the track, “Sube Al Carrusel” turns out to be one of the most unusual and entertaining tracks on the album. Taking the opportunity to change the feel of the album once again, “Fire Away” is the type of track that feels like a rock song with strings. The strings and rock music create a track that feels as if it should be back in the seventies with more of the orchestral rock that was being produced back then. While there is a definite beauty to the music of the track, the one critique I have to make about the track is that this is without a doubt the track with the simplest lyrics on the album. The repetitive nature of the oversimplified lyrics is a bit of a letdown from the rest of the album where the lyrics are a lot stronger. Beto Hale creates one of the strongest and most fascinating tracks with the song “April”. The folk-rock feel to the track works well with the emotional lyrics of the song. The music of the track with the lyrics that have a greater depth than most lyrics of today’s current songs make the song feel as if it had been written back in the late sixties by Roger McGuinn of The Byrds. The harmony in the vocals on the track brings to mind those of McGuinn and the members of The Byrds. The beauty in both the music and the lyrics of the track makes “April” easily one of the best tracks on Rebirth. On the track “I Will Always Be There,” Beto Hale takes his music and adds some influence from bands like Rush. When listening to the track, you can all but hear Geddy Lee and the rest of the band of Rush as Beto creates a track that has a very heavy Progressive Rock feel to it. Once again, the music and lyrics seem to transport the listener back to a time when songwriters used to give thought to the meaning of their lyrics. On “I Will Always Be There,” Beto Hale would seem right at home in the company of those writers. 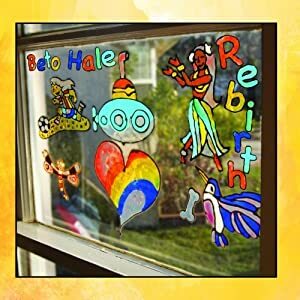 Rebirth from Beto Hale is the type of album you hope for when looking for something new and different. The album provides the listener with many wonderful minutes of different sounds and styles of music from a musician and songwriter who has proven himself as someone who can create songs that will leave you wanting more. To hear more from Beto Hale, check him out on his SoundCloud account.